The Bankhead Theater in Livermore, CA. is a top venue as host to some of the best entertainment being offered in the Bay Area. Early this month it offered some �extra-crispy fun� featuring the Southern Fried Chicks. During this performance, three funny ladies, the Southern Fried Chicks, busted out of the hen house to offer a packed house a night of fun with their new show the �Cage-Free Comedy Tour!� Free-range comedy, stories, music and singing all came together in a show filled with lots of side-splitting laughs. 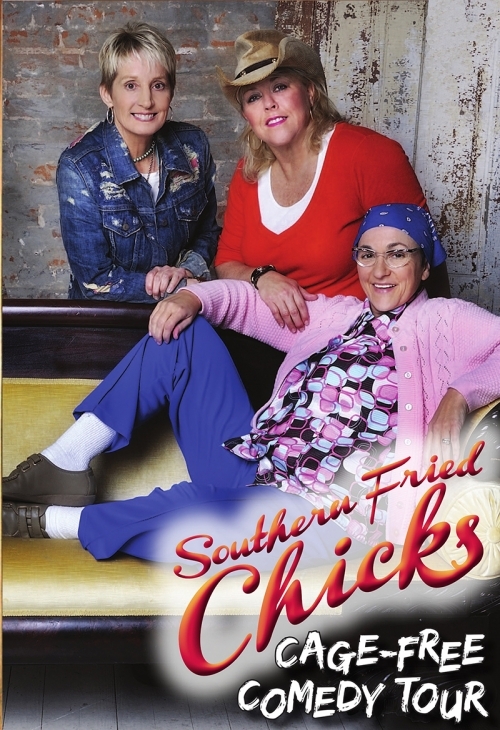 Since their made their debut on Country Music Television, the Southern Fried Chicks have packed venues across the country, poking fun at life and love in the USA. The three chicks, Etta May, Karen Mills and Sonya White brought their new show, described as �blue collar comedy hour with better hair and bigger attitude� to the Bankhead Theater for this one night only performance. Karen Mills finds the funny in everyday life in a style that is clean, clever and relatable. A native of Tennessee, she is a regular on Sirius / XM Blue Collar Radio and Laugh USA. Known for her �Menopause Rap,� a top download on iTunes, and her �Hot Flash Mob� video on YouTube, she has toured with Joan Rivers, Ron White, and Jon Stewart. The Southern Fried Chicks� �Cage-Free Comedy Tour� was just the start of a season filled with great opportunities to enjoy comedy at the Bankhead. The famed San Francisco Comedy Competition, known for helping launch the careers of such legends as Robin Williams, Dana Carvey and Ellen DeGeneres, makes its annual semifinal circuit stop on September 21st. One of the top comedic voices in the country, Tom Papa makes a welcome return to Livermore on October 25th. Then, audiences can laugh through the holidays with Reduced Shakespeare Company�s �Ultimate Christmas Show,� the tongue-in-cheek post-Valentine�s Day show �It�s Not You, It�s Me� with Chicago�s The Second City, and Late Nite Catechism�s Easter show, �Will My Bunny Go to Heaven?� The annual return of The Capitol Steps with their timely, razor-sharp political satire closes the season in May. Stand-up comedy also lights up the Bothwell Arts Center with the return of last year�s sold-out show �One Night, Three Women, Too Funny,� starring local comedians Regina Stoops, Stacey Gustafson and Margaret Zhao on September 29, 2018.